With so many different vinyl flooring styles to choose from, the possibilities are endless. 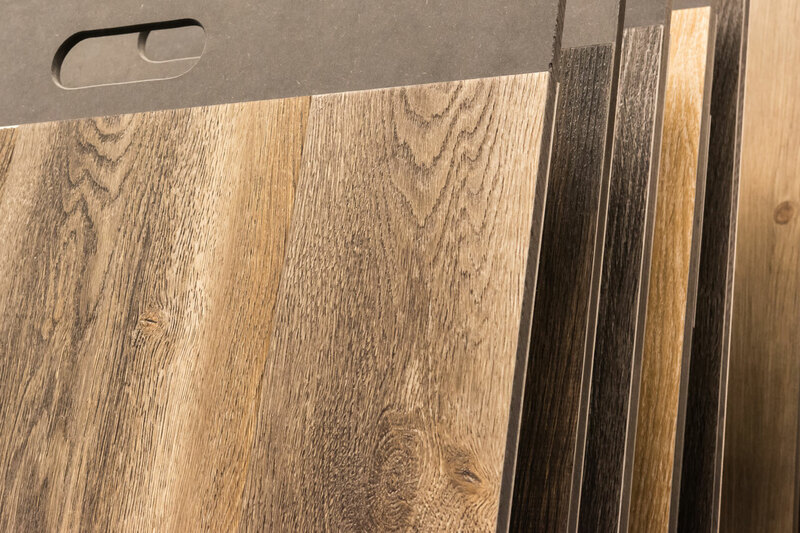 And with a wide price range, the sales team at Okanagan Hardwood Flooring can fit the perfect vinyl choices to the right price point. Colour – consider the size of the room. Darker flooring makes a room appear smaller, lighter makes it appear larger. Your choices are only limited by your imagination - natural hardwood colours from light maple to dark walnut, natural stone colours that mimic travertine, marble, quartz and slate, and high gloss solid colours for that clean, modern look. Pattern – natural stone and wood looks may have some recurrent patterns. Placement of the tiles is important to avoid getting a duplication in the pattern. Many manufacturers now reduce this repetition in tiles to allow for a more natural looking floor. You can mix and match tile sizes and patterns to create a unique “one-of-a-kind” floor. Also, some tiles can be installed with or without grout to have the look of a stone or ceramic tile floor. 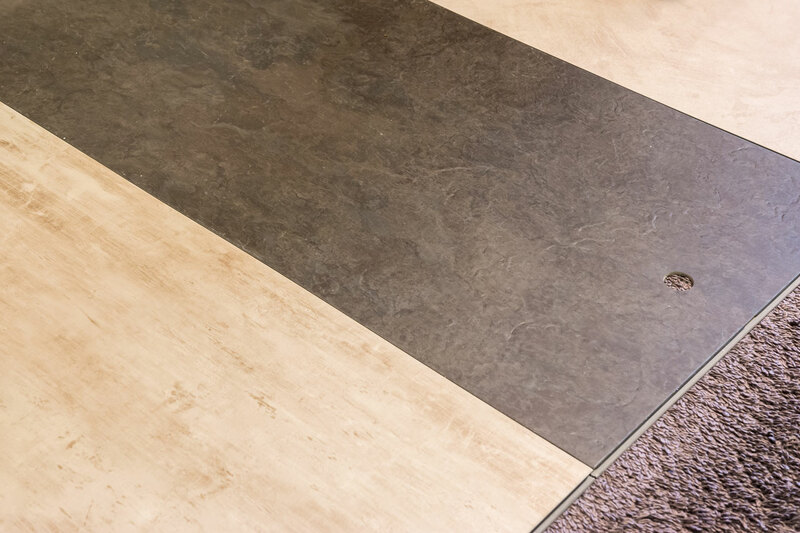 Types – as mentioned in our “How It’s Made” section, there are three main types of vinyl flooring – Sheet, SVT or Solid Vinyl Tile, and LVT or Luxury Vinyl Tile. All three have their advantages and draw backs. 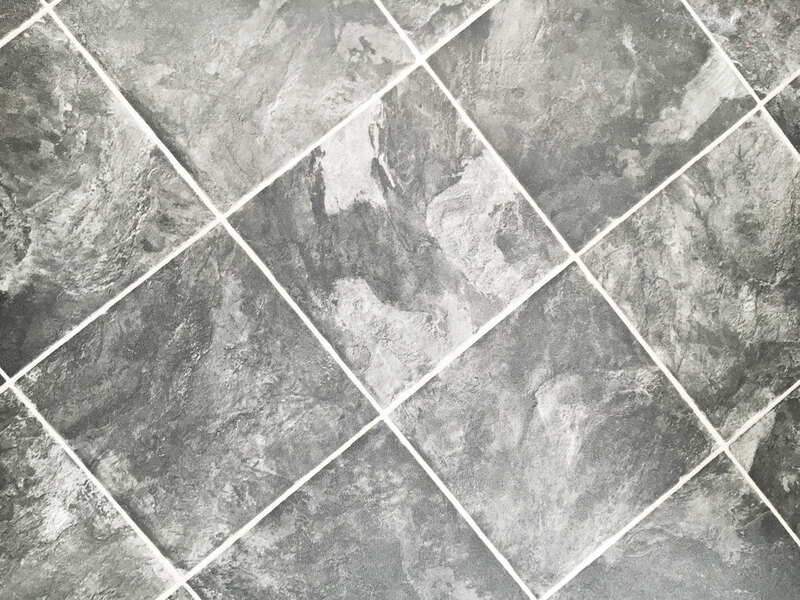 Sheet Vinyl is the least expensive, while the high-end Luxury Vinyl Tile tends to follow the latest design trends, but carries a higher price tag. Usage & Durability – if the area you are considering is heavily used, like a kitchen or mud room, you will want to choose a thicker and more durable vinyl product. Luxury Vinyl Tile is a great choice for flat, level surfaces but cannot be used on stairs. Consider the room and the use, and then talk to our sales staff about which product will be the appropriate choice. Benefits – Anti-bacterial coatings which minimize germs, integrated silence pads for noise reduction, skid resistant surfaces and stain resistant coatings – make sure you find out which of these added benefits are found in the products you choose. Warranty – understanding your warranty is important. Carefully read what is and is not covered with respect to wear and tear. Environment – while most vinyl flooring is derived from a non-renewable source, there are manufacturers who are making strides to develop more eco-friendly products. To improve indoor air quality and emissions, some manufacturers are producing vinyl flooring that is heavy metal free, plus Phenol and Phthalate free. And other companies have developed vinyl flooring that is entirely free of plasticizers which can be fully recycled.